Every day, Watch This offers staff recommendations inspired by the week’s new releases or premieres. This week: The recent teen weepie Me And Earl And The Dying Girl—as well as the emotional new Pixar movie, Inside Out—has us tearfully recalling movies designed to make you cry. 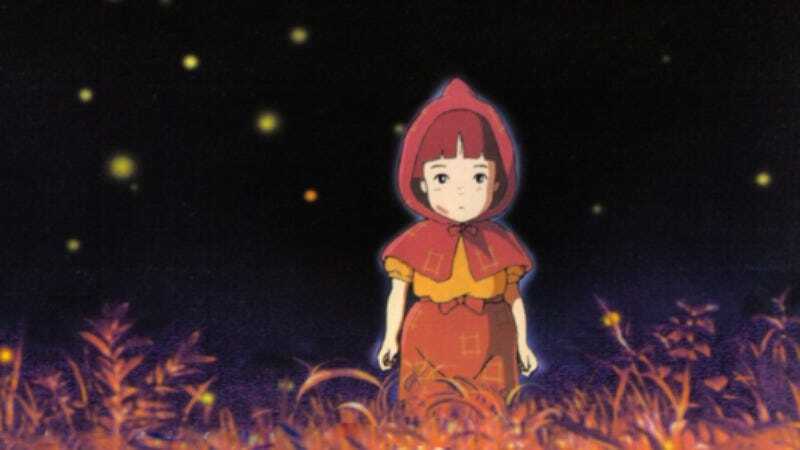 Few wartime dramas are as heartbreakingly intimate as Grave Of The Fireflies, Isao Takahata’s 1988 animated tale (based on Akiyuki Nosaka’s semi-autobiographical short story) about a brother and sister forced to fend for themselves after the death of their mother during a 1945 WWII bombing raid. One of the most assured and affecting films ever released by Japan’s Studio Ghibli, Takahata’s story opens with tragedy (and mournful reunion) before flashing back to the Kobe, Japan home of teenage Seita and his younger sibling Setsuko, which is thrown into disarray when Allied forces rain flaming bombs upon the community. Emerging unharmed by this fiery attack, Seita discovers at a nearby hospital that his mother has been fatally injured. That, in turn, compels the kids to take up residence with their callous, selfish aunt, with the director maintaining a rigid focus on the emotional need, pain, desperation, and fear of his two young protagonists, left suddenly alone in a world that seems to be crumbling around them. Finally beaten down by their aunt’s nastiness, Seita and Setsuko move to an abandoned hillside bomb shelter beside a stream, where the former resorts to stealing and the latter falls ill. Throughout, Takahata’s animation exhibits an understated grace and beauty, employing astute compositional framing to convey, and enhance, his characters’ sense of desolation and isolation. Fireflies—which float in and out of Seita and Setsuko’s bomb shelter, and whose nighttime illumination mirrors that of enemy fighter jet bombs—serve as subtle, multipurpose symbols for the horrors of war and the fragility of life. Marked by an authentic sense of childlike experience, and imbued with an intense compassion for youthful suffering (and the loss of innocence), Grave Of The Fireflies uses moments of happiness and misery to emphasize war’s indiscriminate cruelty, and to underscore the unbearable consequences it has for those unfortunate enough to be caught up in its chaos. Availability: Grave of the Fireflies is available on Blu-ray and DVD through Amazon or possibly your local video store/library. It can also be rented or purchased through the major digital services.